That’s the number of hours that the defender, captain of Liverpool FC Women and newly-announced brand ambassador of Joie Baby, travels to attend training. It would be impressive in isolation, but there are two other important facts to consider. As well as being the mother of a young child – 17-month-old Macie – Bradley-Auckland is the general manager of Edenhurst Rest Home in Nottingham. Despite the remarkable workload for the 29-year-old, she has established herself as a point of reference for LFC Women during this transitional campaign for Vicky Jepson’s side, being ever-present since her arrival from Doncaster Belles back in July and scoring two goals along the way. Her average working day begins at 6.30am, when she’ll spend some precious time with Macie before taking her to the childminder’s then travelling on to Edenhurst, which is owned by her parents. There, Sophie checks in on the residents – who she describes as more like family members – before setting off on the long drive from the East Midlands to Merseyside. Later, she arrives home from training just in time to put Macie to bed. “I guess it’s not the usual start to a day for a professional footballer,” Bradley-Auckland, who represented England at the 2011 Women’s World Cup and Team GB at the 2012 London Olympics, tells Liverpoolfc.com. “But, for me, it’s so important. Macie is my world – my everything – and football definitely comes second to her, but the work at Edenhurst is so important to me because I lost my previous playing contracts through injury, which meant at the time I had nothing to fall back onto. The injury she refers to was a devastating one; Sophie tore her ACL and damaged the cartilage in her knee back in 2014 while playing for Notts County Ladies. Three knee operations and three years on the sidelines would follow before her football career finally resumed in Doncaster, where she helped the Belles win Women’s Super League 2 last season. “Being injured is of course a lonely time,” said the centre-back. “I found myself constantly in the gym, unable to train with my team. “I needed something aside from football; mentally, I was struggling, it was a difficult time. My family were a massive support for me during that time and it’s also when I went into the care home to start work full-time. “I’d always worked there, ever since I’d left school, but that’s when I really stepped in. I said to my dad that if I did get back playing, I would still continue working at the rest home. The place had helped me so much that I wouldn’t want to just leave it to one side. “I then started my NVQ Level 5 in management so that I could take over from my dad. Everyone says I’m crazy and they don’t know how I do it, but I’ve always been driven, always known what I want to achieve and never settled for anything less. Many female professionals delay starting a family until their playing career is over, but Bradley-Auckland believes her story can serve as a positive example for those in a similar position, proving that one does not necessarily preclude the other. “I knew I could get back to playing football but didn’t know if a top club would take me on being a mum and having to go to work before training each day,” added the Liverpool No.6. 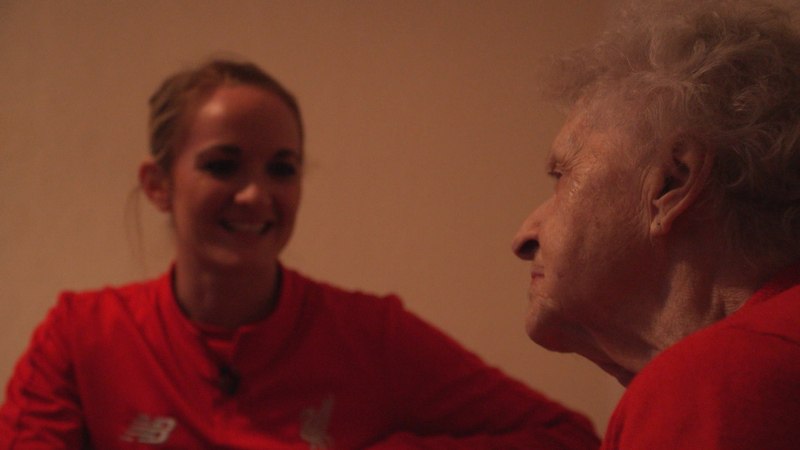 “But coming to Liverpool was like a breath of fresh air; they’ve really understood and helped with my situation. Macie accompanies her mum on away trips with the team and was a mascot when Liverpool took on Manchester City Women at Prenton Park in November. Far from being a burden, Sophie’s responsibilities – for the young and old – provide the energy that powers her through the day. “It’s just second nature,” she concluded. “I don’t see it as a job, for me it’s just something I love doing. It is these caring, family values that make Sophie the perfect brand ambassador for Joie.